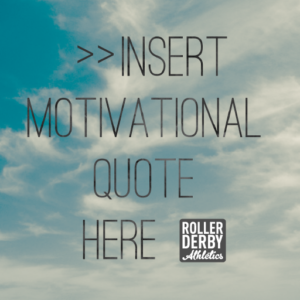 Your inner derby monologue: friend or foe? Many of us struggle with that voice inside. Sometimes self-talk helps us a ton, and sometimes it can be a real jerk! Personally, I know this to be a big limitation for me in certain moments of the game. Rather than believing I can successfully execute the skill I need, I sometimes hear that voice telling me “you’re not gonna make it!” and sure enough… I don’t. Luckily, my guest Jess Bandit is back again for a second week to help you and I harness our Mental Muscle (Check out last week’s Focus Funnel post if you haven’t already) with tips for mastering positive self-talk strategies. On the track, your thoughts can play a major role in the quality of your focus. More specifically, the dialogue that you have with yourself can either strengthen or hinder your performance. This dialogue is known as Self-talk. Talking to ourselves doesn’t mean we’re out to lunch. We go through this process of self-talk to help us interpret our thoughts and feelings. What plays a major role in our performance is HOW we engage in self-talk. The type of self-talk that we choose can have a HUGE influence on our attitude, thoughts, and even our actions when training or competing. 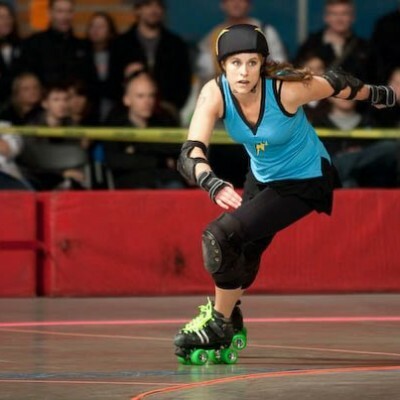 See how each statement can alter a jammer’s attitude about a situation? This is why we need to make sure we are engaging in the right type of self-talk. … Is when your internal voice is framed in an uplifting manner. All of your thoughts and statements are encouraging and directed on what you “can do” or “will do” in certain situations. Your self-talk is meant to keep you in the moment and keep your focus on the task at hand. … Is basically the opposite of positive self-talk. Your internal voice is putting you down. All of your thoughts and statements are discouraging. There’s a focus on what you “can’t do” or on elements that you cannot control. The goal is to engage in Positive Self-Talk during practices and games. The more you engage in positive self-talk, the more your mind will believe in your words. When you say “I can”, your mind will truly believe you can! You are programming your brain to stay positive, focused, and confident even through the challenges. Sadly, the same effects can happen if you’re always engaging in negative self-talk. Your mind will eventually believe that you’re not able to overcome the obstacles in front of you, which will have an impact on your confidence in your abilities. However, just speaking positively might not be enough in every situation. What you choose to say to yourself has an effect on your performance as well. Let’s dive into that next. There are two main functions of self-talk: Instructional and Motivational. Instructional self-talk means that you are telling yourself what you need to do in a given situation. You’re focusing on key elements to concentrate on to help you execute a specific technique or tactical move. Instructional self-talk helps you stay in the present and stay focused on what you need to accomplish. Motivational self-talk means that you’re trying to motivate and encourage yourself through the task. The goal is to try to stay positive and confident in what you can achieve, and to give your full effort. Can you use both functions at once? Yes, you can! Motivational self-talk is a great way to give yourself a boost in morale and confidence. 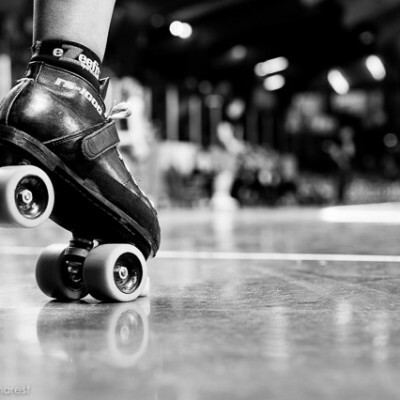 However, as you might have noticed, Roller Derby is an active sport that requires a lot of awareness, power, and quick reaction time; there are not many moments where you have nothing to do. This is where instructional self-talk will come in. Instructional self-talk can help you narrow in on what you need to do in that moment. Both of these examples have a motivational element, as well as an instruction to be followed. This is a great tool to use to re-focus back into game or practice. 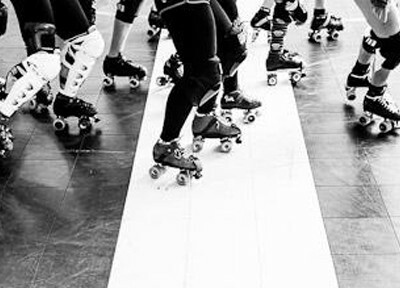 Here are three tips that you can use at your next practice (and even during your daily routines!). Don’t let this internal dialogue happen without processing what you are actually saying to yourself! Even if you are engaging in Positive Self-Talk, you need to recognize that you are! Self- Awareness is KEY. Like I mentioned before, if you always speak to yourself in a negative tone, then your mind is going to start believing in what you’re saying. When you’re more aware, you might catch yourself talking negatively. When you do, don’t let it slide! Stop the negative thought in its tracks! This is where a cue might come in handy. A cue is a signal that you will use to remind yourself that you need to snap out of this negative mind frame. Cues can be Verbal or Physical. Ideally, you want to use the same cue in order to reinforce its meaning. Once you stop the negative self-talk, you need to re-frame that same thought in a positive way. Which leads to my third tip. Use the present tense – focus on what you can do NOW! Each of these examples has taken negative self-talk and turned it into a positive statement with a mission to focus on. Great news: the more times you catch yourself and re-frame your thoughts into positive self-talk, the more automatic it will become. Now it’s your turn to offer advice. What positive self-talk cues do you use already? Or, which parts of this article are you going to use to change your existing inner voice? Let us know in the comments below! Until next time, stay positive, focussed, and have fun out there! With the athletes that I coach and with my teammates, if I hear them speak negatively about themselves I call them out too! They might not realize that their comments are changing their mind frame. What I find helpful….asking them to rephrase it more positively. Such as: “now say that without the word don’t” or “ok, so what can you do instead?”. a couple of years a go, when i found my self, not breathing or getting tense, i would roll my shoulders to make myself tall( i’m quite short) and say I can and a i will, it worked surprisingly well! Great example of using a physical cue and motivational self-talk! One of our teammates started the “etch n’ sketch” and it works great. Basically when everything gets all mucked up you stop, re focus, move your hand down in front of your face like you’re washing all the negativity away and then throw it to the side aggressively. I’ve done it mid jam before it feels amazing. Great read! Lots of awesome information.